Adriana Abich dedicated her career to providing quality education to all students. 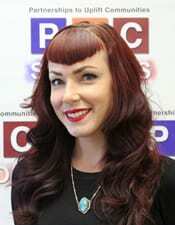 She is a graduate of Occidental College where she studied English and Comparative Literary Studies. She also completed her credential in Occidental’s post graduate program. After leaving Occidental, Ms. Abich worked in several districts teaching students in grades 2 through 5. Through this experience, she developed a passion for improving literacy instruction for all students. This motivated Ms. Abich to take on a position as a Literacy Coach in L.A.U.S.D. She served as a Coach for the teachers in a large elementary school for 4 years. At the same time Ms. Abich continued her education at California State University, Northridge, where she graduated with a Master’s degree in Educational Leadership and Policy Studies. In addition to earning her degree, Ms. Abich also completed her Administrative Services Credential. 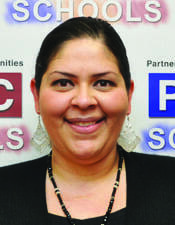 In 2010, she joined PUC Schools as an Assistant Principal and then Principal of Nueva Esperanza Charter Academy. During her years at Nueva Esperanza, literacy continued to be her focus. Ms. Abich and her team developed Guided Reading classrooms which resulted in tremendous growth and achievement in English Language Arts for all students. Over the past 3 years, Ms. Abich has worked as Deputy Superintendent and now Regional Superintendent of schools for PUC. In this role, she works to develop the 10 schools and the school Leaders to ensure quality educational choices in the cities of Sylmar, Pacoima, San Fernando, and Lakeview Terrace. Connie Rivas is the principal of PUC CALS Charter Middle & Early College High School where she has served for over ten years. Her passion for education is deeply rooted in both her personal narrative which includes being among the first in her family to graduate from college along with her own critical consciousness related to social justice. The various capacities in public school settings in which she has served span eighteen years and have all positively influenced and continuously reaffirmed her commitment to education reform in service of students, families, and communities. She has worked closely with students, parents, teachers, administrators, professors, social workers, policy makers, and public figures to continuously engage in the dialogue related to education reform. 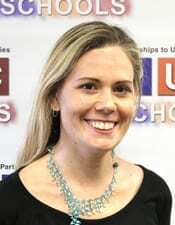 She is a champion for students and a zealous advocate for special education, quality teaching and learning, inclusivity, data driven practices, cultural competence, social-emotional learning and development, home-to-school partnerships, service learning and college and career education in support of all students. 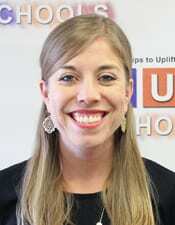 She received a Bachelor of Arts degree in history from California State University, Northridge and later received a Master of Science in Special Education from National University. She is dedicated to ensuring that schools serve as a vehicle for all students to find their purpose, voice, identity, and develop the cognitive and non-cognitive skills to self-actualize in order to uplift themselves, their family, and their communities now and forever. Dr. McOlvin is the Director of Inclusion and Special Education for PUC Schools. In this role, she oversees the special education departments in all PUC schools and helps to support teachers and leaders in developing effective special education practice that promotes inclusion. She also manages the PUC Special Education Support Team. Dr. McOlvin is an active member of LAUSD’s Charter Operated Programs SELPA (Option 3) and maintains collaborative relationships with LAUSD and local charter agencies. Throughout her career, she has held a multitude of roles in special education from paraprofessional, to vocational tech lead, wrap-around care provision, and special education teacher, and special education teacher support provider. Dr. McOlvin worked in a residential school setting in New York, in traditional district and community day schools in Philadelphia, as well as in charter schools in Los Angeles. This cumulative experience has inspired the need for life-long learning to best support systems that provide access to quality education for students with diverse needs. Dr. McOlvin holds a B.S. in English and Education from Villanova University, an M.Ed in Special Education from Chestnut Hill College, and she gained her doctorate in the Educational Leadership Program at UCLA in June of 2018. Gerard Montero was born and raised in the Northeast San Fernando Valley and entered the field of public education at Montague Elementary School over three decades ago. 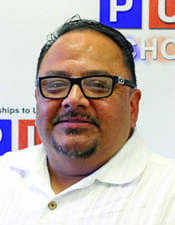 His experience in the charter arena began 20 years ago when Mr. Montero served as a key member of the teacher leadership team during Montague’s conversion to charter status in 1995 and served on the governance board for over 10 years. Deeply committed to excellence in public education and the success of all children Mr. Montero, began as a teaching assistant and then became a teacher. After several years in the classroom, Mr. Montero became Bilingual Coordinator and eventually became Executive Director. Mr. Montero earned his B.A. teaching credential and M.A. in Educational Administration at California State University Northridge. During 2011 and 2013 Mr. Montero served on PUC’s governance board. In 2013 he joined the PUC family as Compliance Coordinator. During that year Mr. Montero followed his dream to start a charter that would represent his core values of excellence, commitment, and love of learning. In 2014, PUC Community Charter Elementary became the first and only PUC elementary in the Northeast San Fernando Valley and currently serves over 300 students from Kindergarten through Fifth grade. Mr. Montero, is also a proud PUC parent. In June 2016, his son graduated from Community Charter Early College High School. Christine Sartiaguda is Director of Clinical Services at PUC and founder of the Clinical Counseling Program. She has over 17 years of clinical experience. Christine is a Licensed Marital and Family Therapist and Registered Art Therapist who clinically supervises Marital and Family Therapy Trainees/Interns as well as Art Therapy Interns. Having graduated with honors with a Bachelors in Psychology, Christine continued on to graduate with honors with her Masters in Marital and Family Therapy specializing in Art Therapy, both degrees from Loyola Marymount University. Prior to coming to PUC, Christine worked at G.L.A.S.S., a non-profit agency helping at-risk youth in foster care. In her position as Director of Training, Program Director of a Day Program, Senior Therapist and Group Home Therapist, Christine was able to demonstrate her versatility, leadership and clinical expertise. In addition to having worked in residential care, Christine has worked at psychiatric hospitals as an Art Therapist, co-facilitating groups for mentally ill adult patients as well as out-patient clinics and schools as a marital and family therapist. Christine has also been an associate professor at Phillips Graduate Institute and has been a guest speaker at graduate classes at Loyola Marymount University and CSUN. In her current position as Director of Clinical Services, Christine over sees the Clinical Counseling Program, Psychological Testing Services, contracted clinical services to outside agencies and all other clinical services within PUC as well as provides direct counseling services and individual and group supervision to the clinical counseling trainees/interns. She is committed to providing optimal clinical services to the students and families at PUC. Dr. Gasca graduated from Georgetown University in May 2003, with a double major in Government and Psychology. Gloria was born and raised in Los Angeles and takes pride to live in a community that strives for their excellence. Dr. Gasca was inspired to pursue a career in education during her time as a Research Assistant for Georgetown University/NIH’s sponsored grant entitled DESARROLLO (Developing Educational Supports And Reading Resources Of Limited English and Literacy Of parents). The passion for education was also reinforced during her time as a Coro Fellow where she realized the strengths, and discrepancies of our educational system. She has continued her commitment to education through her time with PUC Schools. 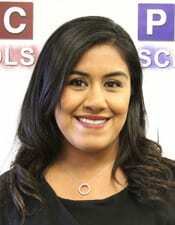 She began teaching with PUC Schools at PUC Milagro Charter School during the 2006 school year. She has developed through PUC and has grown in her leadership. She is a current principal at PUC Excel and was an integral part at securing the charter renewal for another 5 years. She constantly seeks local partnerships with non-profits to improve the opportunities that her students have to grow in their leadership. Gloria received her masters degree in educational psychology and teaching credential at Pepperdine University and received her Administrative Credential along with certificates in special education and charter school leadership from Loyola Marymount University. She earned her doctoral degree from Loyola Marymount University in Education Leadership for Social Justice. Jason Marin is the Principal at PUC CALS Early College High School. Mr. Marin comes from a variety of leadership experience ranging from a Counselor, Dean of Students, and Assistant Principal. Before joining PUC Schools two years ago, Mr. Marin spent 7 years in South Los Angeles where he worked to close the achievement gap for students of color. During his transformational leadership in South Los Angeles Mr. Marin also gained exposure and awareness with students who were exposed to trauma and how best to support their needs. In addition Mr. Marin gained experience in restorative justice dialogue and facilitated trainings for teachers to conduct community circles with theirs students to build community and strengthen relationships. Last year Mr. Marin served as the Assistant Principal at CALS Middle. Mr. Marin was able to bring his expertise and experience to CALS Middle to help refine systems, build partnerships with families and establish positive working relationships with students and teachers. As the PUC CALS Early College High School Principal, Mr. Marin believes in equal access and opportunity for all his students. In addition Mr. Marin believes in serving the whole students to address their academic, personal/social and college/career needs. Mr. Marin is a graduate from California State Los Angeles where he earned a Master of Science in Counseling and Bachelor of Art in Sociology. Mr. Marin also earned an Administrative Credential from Dominguez Hills. Melody Levine Morris is the Principal at PUC Santa Rosa Charter Academy. Before becoming principal, Melody served as the Assistant Principal at PUC Santa Rosa Charter Academy for four years focusing on math instruction and Inclusion Special Education. 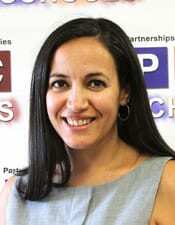 Before joining PUC she served as the Director of School Transformation with the Partnership for Los Angeles Schools in which supported schools in professional development and instruction. Melody was previously a Senior Educational Consultant with the Consortium on Reading Excellence and worked with over thirty schools across the country to provide professional development in best practices in literacy instruction. 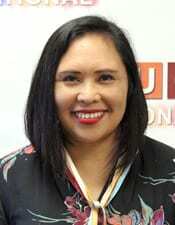 Melody also served as a Teach For America School Director in Long Beach Unified School District and began her career in education as a teacher in the Compton Unified School District. Melody received her undergraduate degree from the University of California at Berkeley and holds a Master’s degree in Education with an emphasis in Curriculum and Instruction from California State University Los Angeles. Sascha Robinett is the founding principal of Milagro Charter School, providing students with both a bilingual and arts integrated education. Prior to starting the school she worked for a national arts-integrated school reform initiative, Different Ways of Knowing, designing and facilitating professional development workshops and creating school programs in arts integration, literacy, teacher leadership, standards-based instruction, and data-driven decision making and receiving intense training from professional artists and arts educators in visual arts, drama, dance, and music. During her classroom teaching experience – in grades three through twelve – she worked with the Amory Center for the Arts in Pasadena to create and implement an arts-integrated sixth grade curriculum program and wrote a school-wide grant (Arts In The Schools) to bring music education from kindergarten through sixth grade to her school. She holds both a clear multiple subject/CLAD credential and a preliminary administration credential. She received her B.A. in Sociology from University of California, Santa Barbara and her M.A. in Educational Leadership from California State University, Los Angeles. 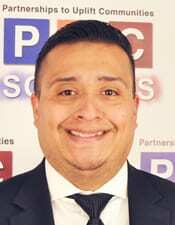 Jorge Beas is the Principal of PUC Lakeview Charter High School, where he previously served as the Assistant Principal for several years. Prior to joining LCHS, Jorge served as the Assistant Principal at PUC Nueva Esperanza Charter Academy. 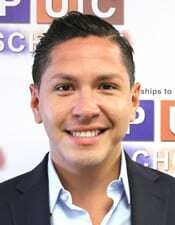 Originally from Lennox California , Jorge graduated from UC Santa Barbara with a degree in History of Public Policy. After graduating from UCSB, Jorge joined Teach for America and was assigned to teach Middle School just a few blocks from where he grew up. Jorge taught Middle School English, History, and PE. After receiving his Master’s in Urban Education and Leadership from Loyola Marymount University, Jorge decided to seek his administrative credential at LMU as well. Jorge joined PUC after completing his administrative credential. Emily Biddle is thrilled to be the Principal of PUC Triumph Charter High School. Prior to becoming Principal, she served as the Dean of Instruction for PUC TCHS. Originally from Northern California, Ms. Biddle grew up in a small mountain town with one stoplight. She moved to Los Angeles to attend UCLA, from which she graduated with a B.A. in English Literature. She completed her graduate studies at Pepperdine University, earning her M.Ed. as well as her teaching credential. She began her teaching career at a charter high school in Granada Hills, where she taught 10th and 11th grade English. Following her position in Granada Hills, Ms. Biddle taught at a small charter high school in Pacoima, where she fell in love with the Northeast San Fernando Valley community. She is excited to continue the work this year at PUC Triumph Charter High School and looks forward to collaborating with students, parents, and staff toward school-wide success. Claudio Estrada, Jr. was born and raised in the San Fernando Valley to Mexican descent parents. As a First-Generation American, he was instilled with his parent’s hard work ethic and drive to pursue the American Dream. After graduating from high school, he completed a yearlong studied abroad program in French language and history in Paris, France and earned a Bachelor of Arts degree in political science with a minor in education at the University of California, Santa Barbara (UCSB.) As an undergraduate student, he worked part-time at an elementary school in Montecito, CA as a special education teaching assistant. During this time, he had the chance to explore the different local school systems through the lenses of many of ethnic studies courses and volunteer projects with the neighboring schools. He soon realized the large discrepancy in the education system that largely divided the allocations of resources and opportunities clearly defined by a zip code. His drive for social justice lead to him to apply the highly coveted Teach For America (TFA) program and was admitted after graduation. After many successful years as a middle school English teacher, Mr. Estrada went on to complete a Master of Arts in Education Policy and Administration at Loyola Marymount University. Today, he brings his narrative as a Mexican- American/First-Generation American, first college graduate in his family, and strong personal ties to the community into his inclusive learning community. As a school leader, he brings an array of elements of high expectations, individualized attention and care to the development of the whole child. He is not reluctant to hold the mirror up to his students so they can truly identify their true potential and fulfill our collective lifelong goal to uplift our communities. He is honored and privileged to collaborate with a team of multitalented educators and families of the thriving community of Lakeview Terrace as the principal of PUC Community Charter Middle School. Dr. Monique Hernandez grew up in the San Fernando Valley. She attended Notre Dame High School located in Sherman Oaks, CA. After graduating from high school, she had her heart set on becoming a lawyer. She earned a Bachelor’s Degree in Political Science and minored in Pre-Law and International Relations. During that time, she traveled around the world to study other countries’ government structures and nation-wide education systems. Through these experiences and many conversations with family, she decided to change her career trajectory from law school to education. After graduating from college, she pursued a Master’s in Education from the University of Southern California and started teaching History at a charter high school located in South Los Angeles. After many years of teaching and inspired by her students, she decided to pursue her Doctoral Degree in Educational Leadership with a concentration in Teacher Education in Multicultural Settings from the Rossier School of Education, University of Southern California. As she earned her doctorate, she transitioned into administration as a Dean of Students for a parochial high school. She joined PUC Community Charter Early College High School as their Assistant Principal and is now honored to serve as their Principal. Melissa began her teaching career St. Louis Public schools at a high school located in North St. Louis. After teaching, Melissa then went on to become a teacher coach for Teach For America. 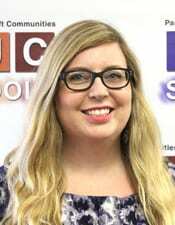 She provided professional development for first and second year teachers and instructional and management on-going coaching and support for teachers K-12 in a variety of subjects. During this time she was trained and certified through the Center for Transformative Teacher Training as a Real Time Teacher Coach and specialized in classroom management coaching. 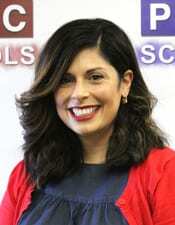 She joined PUC Lakeview Charter Academy as a Dean of Culture and is now serving as Principal. Throughout her career, Melissa has been dedicated to empowering both students and teachers to grow to ensure an excellent education for all. 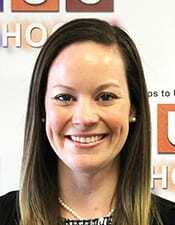 Melissa holds a bachelor’s degree in psychology from the University of the Pacific and a master’s degree in secondary education from the University of Missouri – St. Louis. Jocelyn M. Velez was raised in the Northeast San Fernando Valley and at a young age had aspirations to become an educator. While a student at San Fernando High School, she worked at a local middle school helping students improve their reading skills and grow their reading levels. 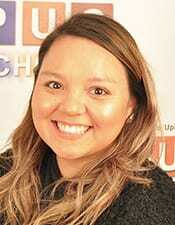 Ms. Velez studied at the University of California Riverside where she received a Bachelor of Arts in Liberal Studies and later received a Master’s of Arts in Education from Pepperdine University. While a student at Pepperdine University, she was introduced to the charter school movement and she spent her time working at a charter elementary school. Ms. Velez’s love for teaching prompted her to pursue a Multiple Subjects Credential and a Single Subject Credential in English Language Arts allowing her the opportunity to teach at the elementary, middle school, and high school level. She began her teaching career as a 7th grade English teacher at PUC Lakeview Charter Academy and went on to teach 9th grade at PUC Lakeview Charter High School where she later served as the Assistant Principal. Her love of learning and commitment to her students pushed her to attend Loyola Marymount University where she received a Master’s Degree in School Administration. Ms. Velez is deeply connected to her community and she has grounded herself in the belief that all students will succeed when provided with the right tools; she has dedicated herself to providing equal opportunities to her students. She is honored to continue her work in the community she grew up in as the principal of PUC Community Charter Elementary. 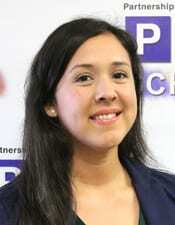 Heather Yoshioka is honored to serve her community as Principal of PUC Inspire Charter Academy. Prior to joining the Panther family, she was a Dean of Instruction and Assistant Principal at PUC Nueva Esperanza Charter Academy. As she was born and raised in Southern California, Mrs. Yoshioka calls the LA and Valley regions her home. She has lived in LA since attending UCLA, from which she obtained a BA in Art History. She also attended UCLA for her graduate studies where she earned her Single Subject Credential in Chemistry, Multiple Subject Credential, and Masters Degree in Education. Currently, Mrs. Yoshioka is earning her Administration Credential from LMU. Before joining PUC, Mrs. Yoshioka taught 6th grade math and science at an independent charter school in Mid-City Los Angeles. Her educational purpose is to passionately serve her students, teachers, families, and school community to drive achievement and provide educational equity and growth for all stakeholders. She builds relationships through integrity, trust and respect in order to develop compassionate and reflective teachers and students who are empowered to succeed in college and future careers and be motivated to make a difference in their community.